This tutorial is going to show you how to install LAMP Server on Debian 9 Stretch. LAMP is a combination between Linux, Apache, MySQL/MariaDB and PHP. With this LAMP we can built a powerful, rock solid web server to host web apps and many other stuffs. There are several steps to install LAMP on Debian 9. Please have a look at my other post on how to install Debian 9 Stretch. On this tutorial, I will guide you to install LAMP Server on a headless Debian 9 server. So, no GUI is available on my case. If you have Debian 8, please visit this page to watch how to install LAMP on Debian 8.8. Open Terminal (if you have GUI) or simply ssh to the Debian 9 Server and login as root. Need to get 2,144 kB of archives. After this operation, 7,137 kB of additional disk space will be used. Now verify the web server. 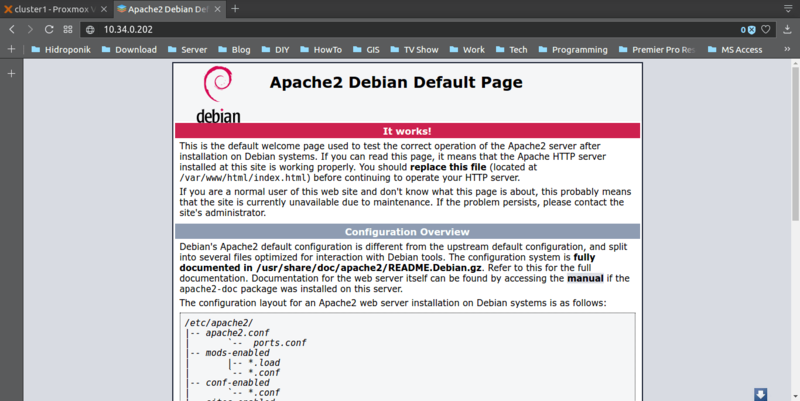 Open a web browser and type the Debian IP address. You should see similar to this one below. Use the following command to install MariaDB Server. FYI, MariaDB is the default database for MySQL package on Debian 9. Need to get 25.3 MB of archives. Jun 24 09:43:39 debian mysqld: 2017-06-24  9:43:39 140594638725696 [Note] /usr/sbin/mysqld (mysqld 10. Jun 24 09:43:39 debian systemd: Started MariaDB database server. Follow on screen wizard to harden the MariaDB installation. Congratulation, you have successfully installed MariaDB Server on Debian 9. Need to get 3,691 kB of archives. At this point we have successfully installed LAMP Server on Debian 9 Stretch. Thank you for reading this post. Please share this article if you found useful. Awesome! I spent all my nerves before this manual, thank you so much!